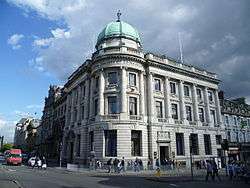 The Royal Society of Edinburgh is Scotland's national academy of science and letters. It is a registered charity, operating on a wholly independent and non-party-political basis and providing public benefit throughout Scotland. Established in 1783, it has since then drawn upon the strengths and expertise of its Fellows, of which there are currently more than 1500. The Society covers a broader selection of fields than the Royal Society of London including literature and history. Unlike similar organisations in the rest of the UK, the Fellowship includes people from a wide range of disciplines – science & technology, arts, humanities, medicine, social science, business and public service. This breadth of expertise makes the Society unique in the UK. At the start of the 18th century, Edinburgh's intellectual climate fostered many clubs and societies (see Scottish Enlightenment). 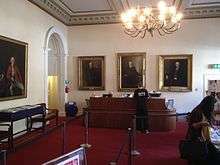 Though there were several that treated the arts, sciences and medicine, the most prestigious was the Society for the Improvement of Medical Knowledge, commonly referred to as the Medical Society of Edinburgh, co-founded by the mathematician Colin Maclaurin in 1731. Maclaurin was unhappy with the specialist nature of the Medical Society, and in 1737 a new, broader society, the Edinburgh Society for Improving Arts and Sciences and particularly Natural Knowledge was split from the specialist medical organisation, which then went on to become the Royal Medical Society. The cumbersome name was changed the following year to the Edinburgh Philosophical Society. 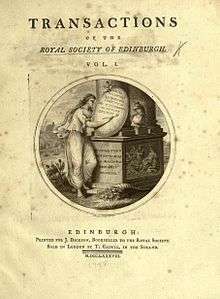 With the help of University of Edinburgh professors like Joseph Black, William Cullen and John Walker, this society transformed itself into the Royal Society of Edinburgh in 1783 and in 1788 it issued the first volume of its new journal Transactions of the Royal Society of Edinburgh. As the end of the century drew near, the younger members such as Sir James Hall embraced Lavoisier's new nomenclature and the members split over the practical and theoretical objectives of the society. This resulted in the founding of the Wernerian Society (1808–58), a parallel organisation that focused more upon natural history and scientific research that could be used to improve Scotland's weak agricultural and industrial base. Under the leadership of Prof. Robert Jameson, the Wernerians first founded Memoirs of the Wernerian Natural History Society (1808–21) and then the Edinburgh Philosophical Journal (1822), thereby diverting the output of the Royal Society's Transactions. Thus, for the first four decades of the 19th century, the RSE's members published brilliant articles in two different journals. By the 1850s, Jameson and his partner Sir David Brewster lost their influence and the society once again could unify its membership under one journal. During the 19th century the society produced many scientists whose ideas laid the foundation of the modern sciences. From the 20th century onward, the society functioned not only as a focal point for Scotland's eminent scientists, but also the arts and humanities. It still exists today and continues to promote original research in Scotland. The current president is Dame Jocelyn Bell Burnell. Fellows of the Royal Society of Edinburgh, are denoted by the use of the initialism or post-nominal FRSE in official titles. The Lord Kelvin Medal is the Senior Prize for Physical, Engineering and Informatics Sciences. It is awarded annually to a person who has achieved distinction nationally and internationally, and who has contributed to wider society by the accessible dissemination of research and scholarship. Winners receive a silver medal and are required to deliver a public lecture in Scotland. The award is named after William Thomson, 1st Baron Kelvin (1824–1907), who was a famous mathematical physicist and engineer, and Professor of Natural Philosophy at the University of Glasgow. Senior Prize-winners are required to have a Scottish connection but can be based anywhere in the world. The Keith medal has been historically awarded every four years for a scientific paper published in the society's scientific journals, preference being given to a paper containing a discovery. It is awarded alternately for papers on Mathematics or Earth and Environmental Sciences. The medal was founded in 1827 as a result of a bequest by Alexander Keith of Dunottar, the first Treasurer of the Society. ↑ "The Royal Society of Edinburgh". School of Mathematics and Statistics, University of St Andrews. Retrieved 22 September 2010. ↑ "Learned Journals". The Royal Society of Edinburgh. Retrieved 28 August 2015. ↑ Waterston, Charles D (1996). "The Home of the Royal Society of Edinburgh" (PDF). Extracted from the Year Book, R.S.E., 1996. Edinburgh: The Royal Society of Edinburgh. Retrieved 1 July 2012. ↑ "Royal Medals". Royal Society of Scotland. Retrieved 4 December 2014. ↑ "Academic excellence recognised as RSE announces Royal Medals and Prizes" (PDF). RSE. Retrieved 4 December 2014. ↑ "New RSE Royal Medal lists and Prize Winners Announced" (PDF). RSE. Retrieved 4 December 2014. ↑ "Royal Medals 2012" (PDF). RSE. Retrieved 4 December 2014. ↑ "HRH The Duke of Edinburgh to present RSE Royal Medals to Baroness Helena Kennedy and Professor Desmond Smith" (PDF). RSE. Retrieved 4 December 2014. ↑ "Keith Medal". Royal Society of Scotland. Retrieved 4 December 2014. ↑ "Makdougall Brisbane Prize". Royal Society of Scotland. Retrieved 4 December 2014. Wikimedia Commons has media related to Royal Society of Edinburgh.